On February 11, 1959 Governor Grant Sawyer signed a proclamation designating that week as Black History Week in Nevada. During the American bicentennial of 1976, Black History Week became Black History Month – a tradition that continues over thirty years later. In honor of Black History Month and in celebration of the achievements and contributions of African-Americans in our state, the ONE has created a Civil Rights in Nevada exhibit. 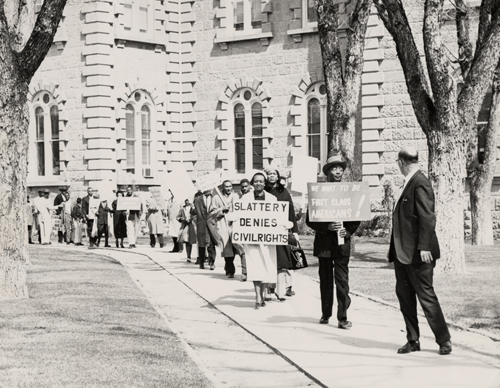 The exhibit captures unique images from the struggle for Civil Rights in Nevada, while the captions highlight the voices of historic Nevadans who lived through and experienced the era. For greater context and entries dedicated to the people and events seen in the exhibit, please visit ONE’s collection of articles on African American History and Civil Rights. This exhibit was created in partnership with a variety of projects and archival repositories and is just the first stop in a tour of Civil Rights history in Nevada. A majority of the images and text have been provided by the University of Nevada Oral History Program (UNOHP). Their project, Nevada Voices, brings to the public transcripts, audio excerpts, photographs, context statements, and brief discussions about three major topics – including the Civil Rights Movement – from over 80,000 pages of transcripts. Much of what you find in the ONE exhibit is developed in much greater detail on their website. We strongly recommend reading the more complete interview transcripts from which we have taken our excerpts. Also, UNOHP has books on the Civil Rights experience in Nevada – more specifically Hang Tough!, which details Governor Grant Sawyer’s years with state and national politics, and Fighting Back: A Life in the Struggle for Civil Rights, which is a memoir of James B. McMillan’s life fighting against racial discrimination. Both books can be found at the UNOHP bookstore. The ONE exhibit also benefits from materials provided by the Oral History Research Center at the University of Nevada, Las Vegas, and the Special Collections Departments at the University of Nevada-Reno Library and the University of Nevada, Las Vegas. There is information to be found on the memories of people who lived in Las Vegas in the early years, women who were Las Vegas showgirls, and a group of friends who experienced school desegregation in Las Vegas in 1964 (Rose Hamilton & Friends). Photograph courtesy of the Nevada State Museum, Las Vegas. With the construction of Hoover Dam outside of Las Vegas, segregation in employment and housing became a focal point for the civil rights movement in Nevada. During the 1930s, the dam project was the major source of employment for the area. At first blacks were denied employment due to race, and it was only through the intervention of the Las Vegas NAACP branch that they were allowed to work at Hoover Dam. 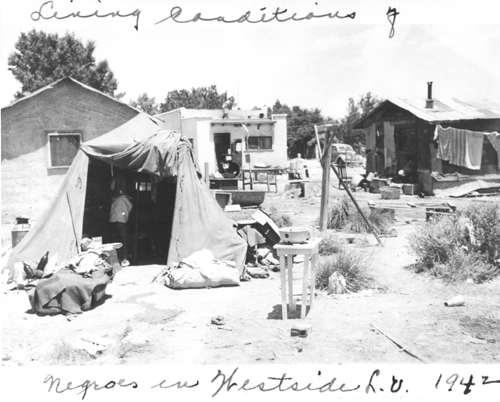 Even then, blacks were systematically excluded from certain types of jobs and housing, and it was during this time that the Westside began to develop as the primary black residential and business community in Las Vegas. Photograph courtesy of Lloyd Gill Collection, University of Nevada, Las Vegas, Library. Image of Mr. Bruno’s daughter in Bruno’s Liquor Store, Westside, Las Vegas, NV. Text courtesy of Claytee D. White, Director of the Oral History Research Center at UNLV. 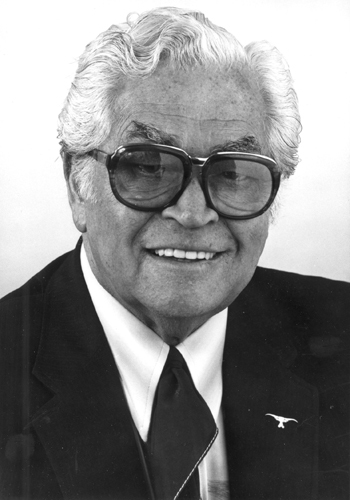 Clarence Ray (1900-1993) began his career as a professional gambler in California and in 1925 moved to Las Vegas to continue his work until his retirement from the Dunes in 1983. He helped found the Nevada NAACP in 1928 and later the Nevada Voters League. Clarence Ray was interviewed by Helen Blue and Jamie Coughtry in 1989 and 1991. Text courtesy of the University of Nevada Oral History Program. Lubertha Johnson was born in Ackerman, Mississippi, and moved first to Chicago and later to California before arriving in Las Vegas in 1943 to work at Carver Park, an all-black housing project. She was a member and president of the Las Vegas NAACP and started Operation Independence, an anti-poverty program. She remained active in the black community until her death. Lubertha Johnson was interviewed by Jamie Coughtry in 1988. 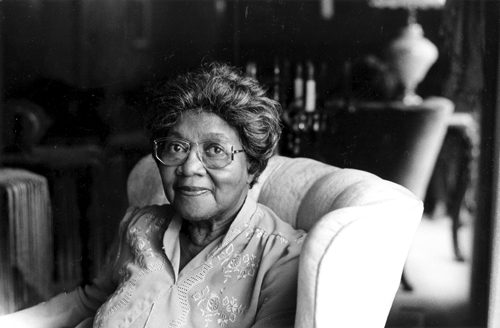 Lubertha Johnson was interviewed by Jamie Coughtry in 1987 to 1988. Morton Saiger (1903-1997) came to Las Vegas in 1942 to work at the Last Frontier. In his capacity as executive host, he dealt with all of the black entertainers who performed at the casino. “When I was at the Last Frontier, before working the lights, if we had some black entertainers, I had to pick them up at 6:00 to bring them down to the show. We had rooming houses in the Westside, which was known as the colored neighborhood at that time, and we roomed them over there. Then I had to take them back after midnight, right after the second show, because there was no other transportation over to the Westside. "When the weather was nice, it was beautiful, but after a rain, my station wagon used to sink in there because there was no paved roads in the Westside. We had the entertainers such as the black people—Sammy Davis Jr. and his father and uncle, the Mastin Trio. Ted Lewis had black assistants. So many of the black . . . Arthur Lee Simpkins, they all worked here, but they could not stay in the hotel. It was unfortunate, but that was the law; they could not stay in this hotel or in any other. I remember Eddy Anderson, ‘Rochester’ from Jack Benny's fame. I was so hurt that I couldn't see straight, because this is the way I was treated in Poland, as a Jew, so I just ached. I'm telling the truth. Morton Saiger was interviewed by R.T. King in 1985. 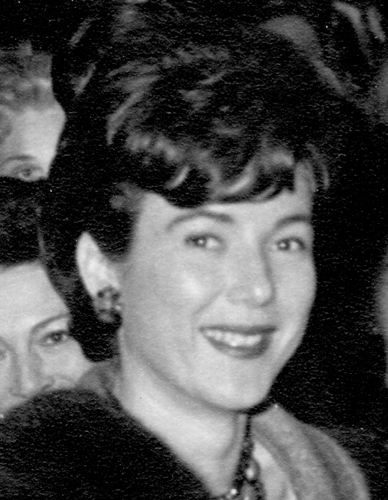 Yvonne “Todd” Davis (1932-2005) worked at Harolds Club as a dealer from 1954-1970. “I think one of the most embarrassing things I ever saw in my life happened after the Civil Rights Movement, when blacks were allowed in the clubs. I was over at Harrah’s, and this black man came in and ordered a drink. The bartender finally served him, and the bartender stood right in front of him until he finished the drink. Then he took the glass, and he broke it in the sink. I just turned around and walked out. "Even though Harolds Club was guilty, too, it’s hard to believe that actually went on in this town. Sammy Davis, in his book, said that his big thing was when he played the Strip, that he couldn’t even stay in the hotels. And he stayed away, and he always wanted to be able to walk in the front doors. The Mills Brothers couldn’t stay in the hotel. They couldn’t eat in the restaurant. The only one that got away with it at the Riverside (in Reno) was Billy Daniels. Yvonne Davis was interviewed by Dwayne Kling in 1997 to 2000. Milos “Sharkey” Begovich (1926-2002) worked for Bill Harrah’s Lake Tahoe casino in various positions from 1956 until 1963. He later owned his own casino, Sharkey's Nugget, in Gardnerville, Nevada. Milos Begovich was interviewed by Dwayne Kling in 1997 to 1998. 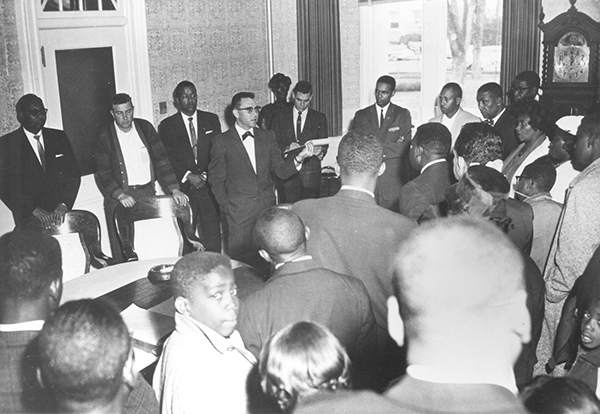 Image from a mid-to-late 1950s NAACP meeting where hotel desegregation was being discussed. Text courtesy of Bertha M. Mullins, Elmer R. Rusco, and Angela D. Taylor. Woodrow Wilson (1915-1999) was born in Morton, Mississippi, and moved to Las Vegas in 1942 to work at the Basic Magnesium Plant in Henderson. 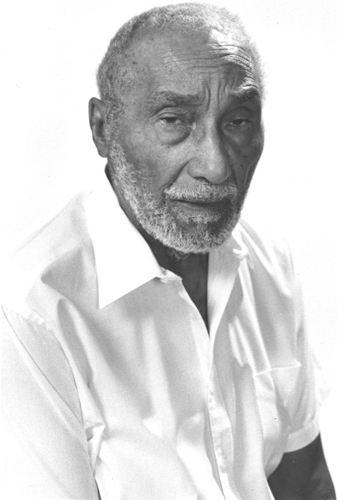 He was a member and president of the NAACP in the 1950s and 1960s, and he started the Westside Credit Union in 1951. In 1967, he became the first elected black legislator in Nevada history, and he served until 1971. Wilson was interviewed by Jamie Coughtry in 1988 to 1990. James McMillan (1917-1999) was born in Aberdeen, Mississippi, and moved north with his family to Detroit when he was five. After graduating from dental school, he served in both World War Two and the Korean War, and he moved to Las Vegas in 1953, becoming the first black dentist in Nevada. He was a member of the Las Vegas branch of the NAACP and served as its president from 1954 to 1961, and he was also a founder of the Nevada Voters League. 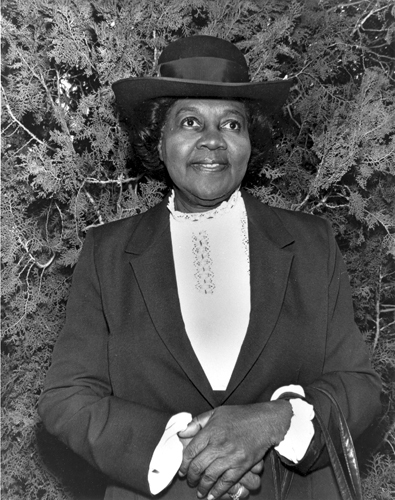 McMillan served as local branch president of the NAACP during the dramatic ending of public accommodations discrimination in Las Vegas in 1960. Text courtesy of the University of Nevada Oral History Program and Elmer Rusco. 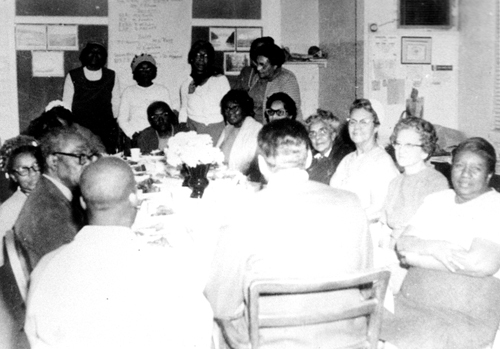 Image of the March 1960 meeting at the Moulin Rouge hotel-casino (Westside, Las Vegas, NV) to end segregation on the Las Vegas Strip. Dr. James B. McMillan is at the head of the table, flanked by Mayor Oran Gragson (l.) and Hank Greenspun (r.). Text and photograph courtesy of the University of Nevada Oral History Program. By the end of the 1940s, the gaming industry was the major source of employment in Las Vegas, but segregation limited blacks to the most menial jobs on the Strip and denied them access to the hotel-casinos as customers. The black community in the 1950s sought an end to racial discrimination using boycotts and demonstrations, which culminated in 1960 with the Moulin Rouge Agreement. 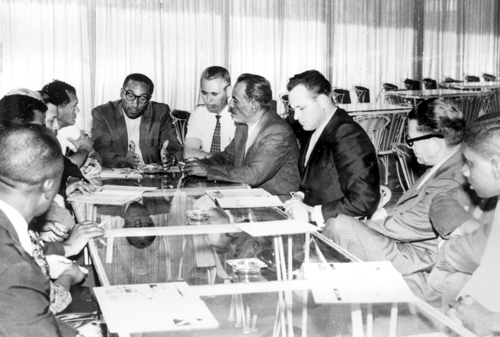 The Moulin Rouge Agreement occurred on March 25th, 1960, as part of negotiations between the black community, Las Vegas business leaders, and local and state government officials to avert a demonstration scheduled for the next day on the Las Vegas Strip. 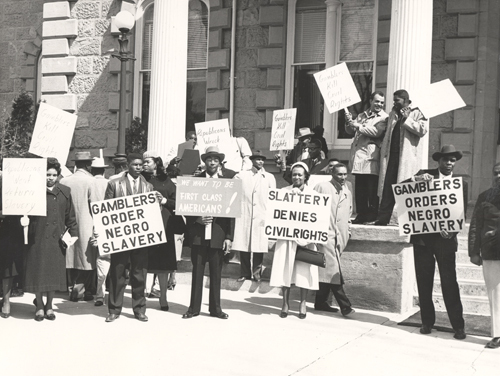 The agreement required the gaming industry to stop discriminating against blacks in employment and to open hotel-casinos to blacks as customers. 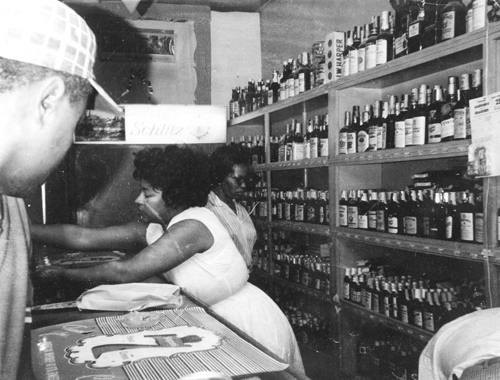 As a result of the settlement, the gaming industry expanded employment opportunities for blacks to include the positions of dealers, floor managers, and personnel managers. Blacks also formed teams to test access to the hotel-casinos. A few casinos, such as the Sal Sagev and Binion's, did not participate in the agreement until later. 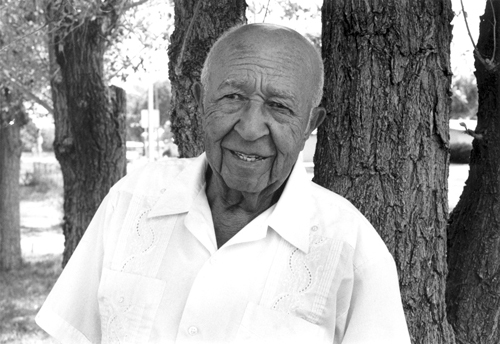 Dr James McMillan was the president of the Las Vegas NAACP at the time and acted as the voice of the black community in the negotiations, while other NAACP members at the meeting included Dave Hoggard, Woodrow Wilson, Bob Bailey, Lubertha Johnson, and Donald Clark. Hank Greenspun of the Las Vegas Sun acted as mediator, and Las Vegas Mayor Oran Gragson and Nevada Governor Grant Sawyer were also instrumental in achieving the agreement. Oscar Crozier, the black owner of the El Morocco, had connections to the gaming industry and played an important role as a liaison between the NAACP and the hotel-casino owners. Image of opening night at the Moulin Rouge Hotel, Las Vegas, NV 1955. 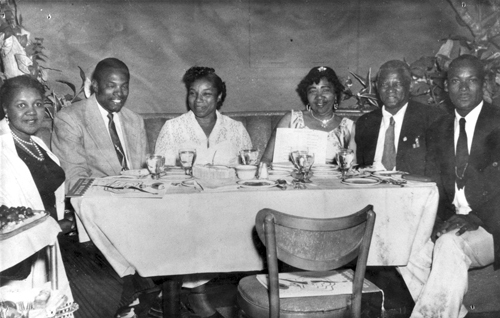 L. to r.: Lubertha Johnson, unidentified, Louise Leggroan, Mr. and Mrs. Eddie Lofton, unidentified. 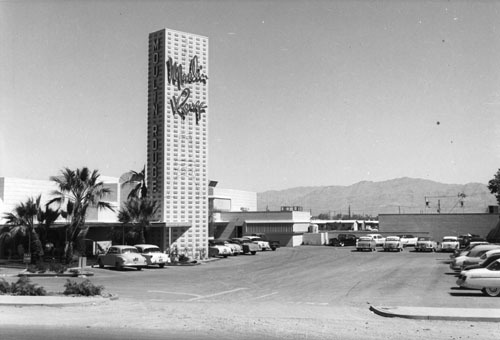 In 1955, the Moulin Rouge hotel casino, the first integrated upscale establishment in Las Vegas and one that rivaled venues on the Strip and downtown, was built on the outskirts of the Westside. Joe Louis, one of the most famous heavyweight champions in history, served as greeter, the line of black dancers was featured on the cover of Life Magazine, and the nightly crowds were peppered with Hollywood’s elite. The above image was taken on opening night and includes well-known Nevadans Lubertha Johnson, Louise Leggroan, and Mr. and Mrs. Eddie Lofton. 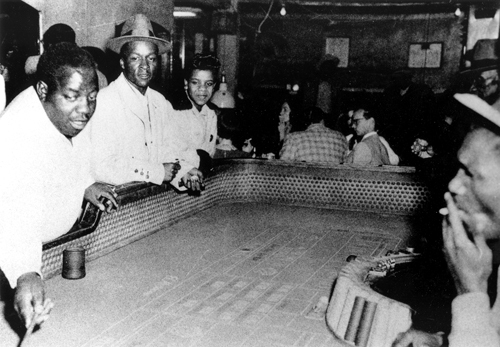 Image of Calvin Washington (far left) running the crap game at the El Morocco Club on the Las Vegas (NV) Westside, the final night before its 1954 closing; standing next to him is Cleo Johns. An image from the final night of gaming at the El Morocco Club before the doors shut in 1954. The El Morocco was rebuilt by black owner Oscar Crozier shortly after its closing, and he operated the club until about 1964. Crozier had connections to the gaming industry and played an important role as a liaison between the NAACP and the hotel-casino owners. This photograph was taken at a 1957 meeting of leaders in Las Vegas. 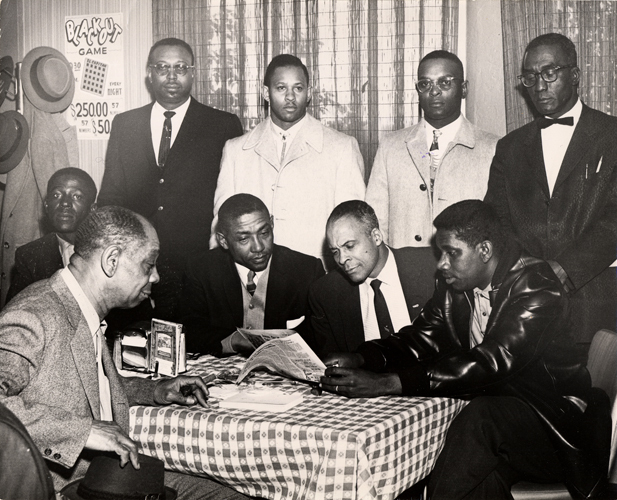 L. to R.: Charles Kellar, Woodrow Wilson, Clarence Ray, Jim Anderson, and Reverend Davis are some of the more significant names in the fight for civil rights in Nevada – men who fought for equality in education, housing, employment, and daily life. Photograph courtesy of Donald M. Clark Collection, University of Nevada, Las Vegas, Library. 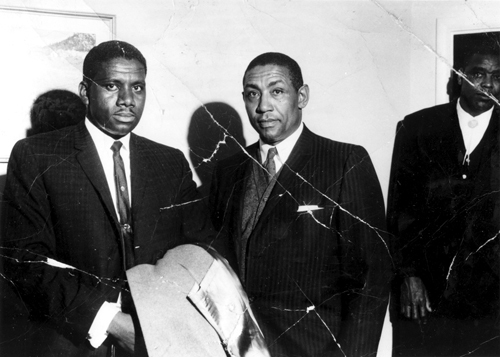 Image of Donald M. Clark, Charles Kellar, and William Bailey – Westside (Las Vegas, NV) businessmen who met with Governor Grant Sawyer in 1961 to discuss employment of blacks in the gaming industry. In the 1960s, the focus of employment discrimination in Las Vegas shifted to the gaming industry. Casinos were then the major source of employment in the area, yet blacks were limited to menial jobs. With the growth of the tourist industry in Las Vegas, hotel-casinos became more sensitive to boycotts and marches, and the NAACP used the threat of demonstrations during important events to force the gaming industry to end discrimination in employment and open access to public accommodations. 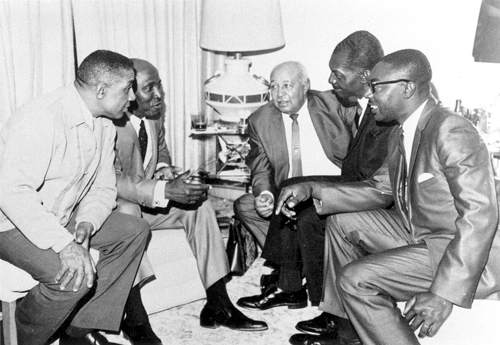 Image of Donald Clark, Bob Davis, Leo Jones, Charles Kellar, George McNeal, Eddie Scott, Rev. Prentiss Walker, Joe Williams, and Ulysses Woodard, NAACP members, at the El Capitan in Hawthorne, Nevada on January 27, 1962. Photograph courtesy of Special Collections, University of Nevada, Reno. Gov. Grant Sawyer (1918-1996) was interviewed by Gary E. Elliot in 1991 and 1993. 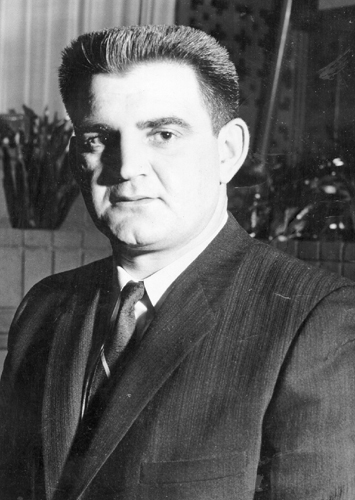 James Slattery (1907-1986) served Northern Nevada as a state senator from 1954-1970 and was a well-known conservative who often opposed civil rights legislation. James Slattery was interviewed by Mary Ellen Glass in 1970. 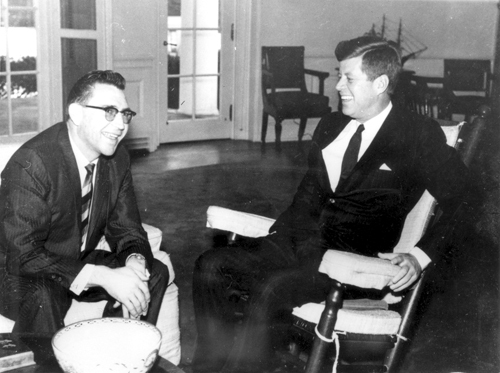 Governor Grant Sawyer meeting with President John F. Kennedy in the Oval Office. Governor Grant Sawyer (1918-1996) began his distinguished public service career as the District Attorney in Elko in 1950. He served as a University Regent, before serving as governor for two terms (1958-1966). 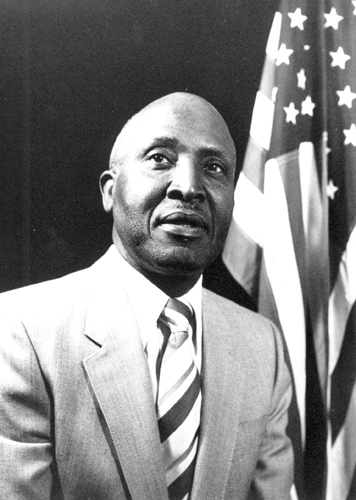 Sawyer was dedicated to civil rights and improving the lives of blacks in Nevada, and during his administration, much of the important civil rights legislation in Nevada was passed. 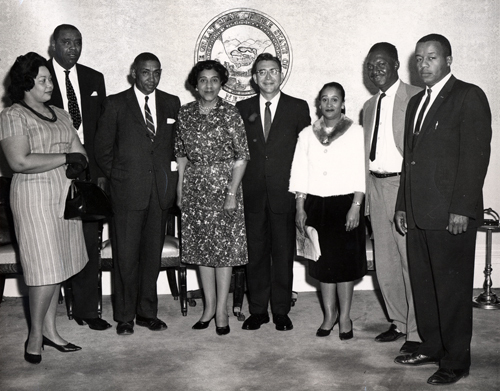 Governor Grant Sawyer with members of the NAACP, including Dorothy Cager, William Bailey, Charles Kellar (Las Vegas branch), Clara Fells, Tarea Hall Pittman (regional field secretary), James Anderson (Las Vegas branch), and Samuel Baynes. Governor Grant Sawyer (1918-1996) was interviewed by Gary E. Elliot in 1991 and 1993. Photograph courtesy of Nevada State Library and Archives. Governor Grant Sawyer meeting with NAACP leaders and other civil rights activists at the Capitol Building in Carson City. Governor Grant Sawyer was interviewed by Gary E. Elliott in 1991 and 1993.